Jake Manning’s smart mouth frequently gets him into trouble. Because of it, he can’t hold a job. Combined with some bad luck, it's prevented him from keeping steady employment. A huge debt looms over him, and alone he shoulders the care of his alcoholic mother and three younger sisters. When a housekeeping position opens, Jake’s so desperate he leaps at the opportunity. On landing, he finds his new boss, Patrick Stanford, a fussy, arrogant, rude… and blind man. 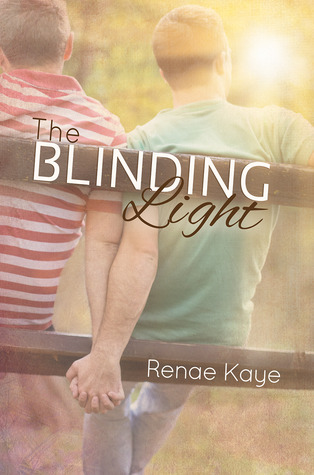 Renae Kaye sure knows how to write them. Realistic, funny and Aussie-flavored, her romances are truly unlike any other. My favorite thing about her is that the word angst doesn’t seem to be in her dictionary at all. Instead of creating unbearable drama, she relies on excellent characterization and humor in all her books. Blinding Light is a shining example and a clear demonstration of everything I love about her. We meet Jake at his low. He is looking for a second job and barely scraping by. We soon learn, however, that Jake isn’t the type to wallow and lament. He is the type who works hard, sacrifices everything for his family, and has a whole lot of fun in the process. Jake’s desperately needed second job ends up being a housekeeping position for a blind man. Mr. Patrick Stanford is so unbearably difficult that the agency has to send him a new housekeeper every couple of weeks, but Jake is made of different stuff. He is determined to keep the job and that’s exactly what he does. But when Mr. Stanford stays home from work one day and Jake finally sees him, all his assumptions vanish with one look at the gorgeous 30-year-old in front of him. Mr. Stanford is not some old, obnoxious guy – he is heart-stoppingly gorgeous. And kind of hilarious too. It’s impossible not to love Jake from the very first sentence he shares with us. He grew up poor with an alcoholic mother and an endless stream of men in her bedroom, he practically raised his three sisters all on his own and he still does absolutely everything to make their lives easier, even if it means sacrificing his happiness. He has so much pride and he is so joyful despite everything, he will make you smile on every single page. I’ve read five of Renae’s novels so far and I loved them all. This may be my favorite, but the others aren’t far behind. I’d recommend starting either with Blinding Light or with Loving Jay. Both are available in audio format as well. Glad this is an author that you can count on to deliver Maja, great review! I'm really glad that you are highlighting all these LGBT reads, Maja! To be honest, I don't see these books featured enough in the blogs I follow, and it's really nice to see that there is actually a lot of diversity in the books we read, we simply need to find them. Shall add this one to my TBR to be checked out later! I confess that I'm not that much into m/m stories but maybe I shoul try more. This one sounds well done. Aww! I love the sound of this one, Maja. It sounds like a sweet romance and has a character with a disability. Plus, it sounds like it's really well-written. Oh this sounds wonderful! I love that it lacks drama! This one sounds great indeed and one that I feel like I must add to my wish lost for sure! Great recommendation Maja, I really like books with humour and no angst! !